Zaza–Gorani languages, which are spoken by communities in the wider area who identify as ethnic Kurds, are not linguistically classified as Kurdish. Zaza-Gorani is classified as adjunct to Kurdish, although authorities differ in the details. Windfuhr 2009 groups Kurdish with Zaza Gorani within a "Northwestern I" group, while Glottolog based on Encyclopædia Iranica prefers an areal grouping of "Central dialects" (or "Kermanic") within Northwest Iranic, with Kurdish but not Zaza-Gorani grouped with "Kermanic". Barzani Jewish Neo-Aramaic is a modern Jewish Aramaic language, often called Neo-Aramaic or Judeo-Aramaic. It was originally spoken in three villages near Aqrah in Iraq. The native name of the language is Lishanid Janan, which means 'our language', and is similar to names used by other Jewish Neo-Aramaic dialects (Lishan Didan, Lishanid Noshan).It is nearly extinct, with only about 20 elderly speakers today. Betanure Jewish Neo-Aramaic, the local dialect of Betanure, is among the rarest and most seriously endangered varieties of Aramaic spoken at the present time. It is also one of the most conservative of the Jewish Neo-Aramaic languages, and among the Northeastern Aramaic languages. Ergative–absolutive languages, or ergative languages are languages that share a certain distinctive pattern relating to the subjects (technically, arguments) of verbs. Examples are Basque, Georgian, Mayan, Tibetan, a few Indo-European languages (such as the Kurdish languages and Hindi) and, to some degree, the Semitic modern Aramaic languages. In an ergative language, the single argument ("subject") of an intransitive verb behaves like the object of a transitive verb, and differently from the agent of a transitive verb.That is in contrast to nominative–accusative languages, such as English and most other Indo-European languages, where the single argument of an intransitive verb ("She" in the sentence "She walks.") behaves grammatically like the agent of a transitive verb ("She" in the sentence "She finds it.") but differently from the object of a transitive verb ("him" in the sentence "She likes him."). In ergative–absolutive languages with grammatical case, the case used for the single argument of an intransitive verb and the object of a transitive verb is the absolutive, and the case used for the agent of a transitive verb is the ergative. In nominative–accusative languages, the case for the single argument of an intransitive verb and the agent of a transitive verb is the nominative while the case for the direct object of a transitive verb is the accusative. There is a variant group, the ergative-accusative languages (such as Dyirbal), which function ergatively with respect to nouns but are nominative-accusative with pronouns.Several scholars have hypothesized that Proto-Indo-European was an ergative language. However, this hypothesis is disputed. Friedrich Carl Andreas (14 April 1846 in Batavia – 3 October 1930 in Göttingen) was an orientalist of German, Malay and Armenian parentage (descendant of the Bagratuni or Bagratid royal family (Armenian: Բագրատունի). He was the husband of psychoanalyst Lou Andreas-Salomé. He received his education in Iranian and other oriental studies at several German universities, obtaining his doctorate at Erlangen in 1868 with a thesis on the Pahlavi language. Following graduation, he continued his research of Pahlavi in Copenhagen. From 1875 he spent several years conducting field studies in Persia and India, during which time, he also worked as a postmaster.From 1883 to 1903 he gave private lessons in Turkish and Iranian in Berlin, and afterwards became a professor of Iranian philology at the University of Göttingen. Here, he was tasked with deciphering manuscript fragments that were collected by the German Turfan expeditions in western China.Not a prolific author of books, he preferred to share his knowledge with students and colleagues orally. His primary focus were the Iranian languages in their development from antiquity to the present; e.g. Afghan, Balochi, Ossetian and Kurdish languages. He was also thoroughly familiar with Sanskrit, Hindustani, Arabic, Aramaic, Hebrew, Armenian and Turkish. In addition, he was considered an excellent decipherer of manuscripts and inscriptions. Garshuni or Karshuni (Syriac alphabet: ܓܪܫܘܢܝ, Arabic alphabet: كرشوني) are Arabic writings using the Syriac alphabet. The word "Garshuni" was used by George Kiraz to coin the term "garshunography", denoting the writing of one language in the script of another. Gorani (also Gurani) is a traditional literary language of Kurdish speakers in Zagros Mountains. Some researchers consider Gorani a dialect of Kurdish. However, since the beginning of 20th century some researchers have identified Gorani as a member of the Zaza-Gorani subgroup of the Northwestern Iranian languages.Hawrami (or Hewrami) is an alternate name of Gorani. It has similarities with other languages of the Zaza-Gorani subgroup of the Northwestern Iranian languages. Gorani is most similar to languages like Zazaki, Shabaki, Bajelani and Sarli. Gorani or Hawrami is spoken in the southwestern corner of province of Kurdistan and northwestern corner of province of Kermanshah in Iran, and in parts of the Halabja region in Iraqi Kurdistan and the Hawraman mountains between Iran and Iraqi Kurdistan.The oldest literary documents in these related languages, or dialects, are written in Gorani. Hulaulá (Hebrew: יהודיותא‎) is a modern Jewish Aramaic language, often called Neo-Aramaic or Judeo-Aramaic. It was originally spoken in Iranian Kurdistan and small parts in the easternmost parts of Iraqi Kurdistan. Most speakers now live in Israel. The name Hulaulá simply means 'Jewish'. Speakers sometimes call their language Lishana Noshan or Lishana Akhni, both of which mean 'our language'. To distinguish it from other dialects of Jewish Neo-Aramaic, Hulaulá is sometimes called Galiglu ('mine-yours'), demonstrating different use of prepositions and pronominal suffixes. Scholarly sources tend simply to call it Persian Kurdistani Jewish Neo-Aramaic. Hulaulá is written in the Hebrew alphabet. Spelling tends to be highly phonetic, and elided letters are not written. The Iraqi people (Arabic: العراقيون ʿIrāqiyyūn, Kurdish: گه‌لی عیراق Îraqîyan, Classical Syriac: ܥܡܐ ܥܝܪܩܝܐ‎ ʿIrāqāyā, Turkish: Iraklılar) are the citizens of the modern country of Iraq.Arabs have had a large presence in Mesopotamia since the Sasanian Empire (224–637). Arabic was spoken by the majority in the Kingdom of Araba in the first and second centuries, and by Arabs in al-Hirah from the third century. Arabs were common in Mesopotamia at the time of the Seleucid Empire (3rd century BC). The first Arab kingdom outside Arabia was established in Iraq's Al-Hirah in the third century. Arabic was a minority language in northern Iraq in the eighth century BC, from the eighth century following the Muslim conquest of Persia, it became the dominant language of Iraqi Muslims because Arabic was the language of the Quran and of the Abbasid Caliphate.Kurds who are Iraqi citizens, live mostly in the Zagros Mountains of northeast Iraq to the east of the upper Tigris. Arabic and Kurdish are Iraq's national languages. 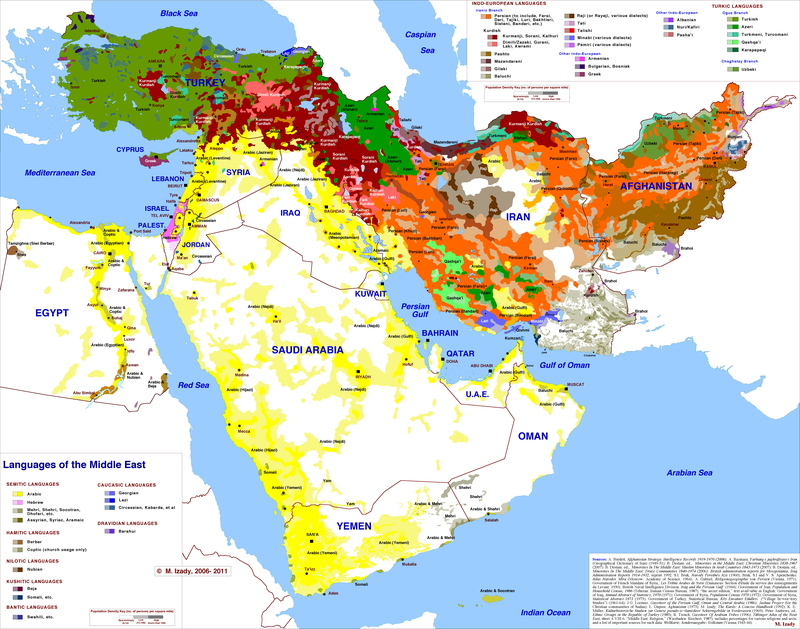 Kurdish languages, Northwestern Iranian languages spoken by the Kurds. Kurdification is a cultural change in which non-ethnic Kurds or/and non-ethnic Kurdish area or/and non-Kurdish languages becomes Kurdish. This can happen both naturally (as seen in Turkish Kurdistan) and deliberately (as seen in Iraq after the invasion of Iraq).The notion of kurdification is different from country to country. In Turkish Kurdistan, many ethnic Armenians, Bulgarians, Circassians, Chechens, Georgians, Ingushs, and Ossetians have become kurdified, as a result of fleeing to the region and having subsequently interacted with ethnic Kurds. In Iraqi Kurdistan, currently the minorities like Turkmens, Assyrians, Yazidis and Shabaks underwent a process of Kurdification in the disputed territories of northern Iraq when Kurdish forces administrated the area until 2017. The Kurdish languages are written in either of two alphabets: a Latin alphabet introduced by Jeladet Ali Bedirkhan (Celadet Alî Bedirxan) in 1932 (Bedirxan alphabet, or Hawar after the Hawar magazine), and a Persian alphabet-based Sorani alphabet, named for the historical Soran Emirate of present-day Iraqi Kurdistan. The Kurdistan Regional Government (KRG) has agreed upon a standard for Sorani, implemented in Unicode for computation purposes.The Hawar is used in Turkey, Syria and Armenia; the Sorani in Iraq and Iran. Two additional alphabets, based on the Armenian alphabet and the Cyrillic script, were once used in Armenian Soviet Socialist Republic. Lishana Deni is a modern Jewish Aramaic language, often called Neo-Aramaic or Judeo-Aramaic. It was originally spoken in northern Iraq and southeastern Turkey in the lands west of the Great Zab river (Athura). Following the exodus of Jews from the Muslim lands, most speakers now live in Israel, principally Jerusalem and surrounding villages. The name Lishana Deni means 'our language', and is similar to names used by other Jewish Neo-Aramaic dialects (Lishan Didan, Lishanid Noshan). Other popular names for the language are Lishan Hozaye, 'the language of the Jews', and Kurdit, 'Kurdish'. Scholarly sources tend simply to refer to Lishana Deni as Zakho Jewish Neo-Aramaic although it was spoken in the entire region west of the Great Zab river. Shabaki is an Indo-Iranian language and belongs to the subgroup Zaza-Gorani of the Northwestern Iranian languages. The Shabaki language is spoken by the Shabak people in the Mosul region of northern Iraq. It has similarities with the Northwestern Iranian language Gorani (or Hawrami), which is often referred as a "Kurdish dialect", although the Kurdish languages form an independent group within the Northwestern Iranian languages. Shabaki is a distinct language. It also has elements of Arabic, Turkish and Persian language. The number of speakers of Shabaki was estimated in 1989 to be between 10,000 and 20,000. Currently, the number of native speakers of Shabaki is estimated at 250,000. As Shabaki is one of the Zaza–Gorani languages, it is most similar to languages like Gorani (Hewrami), Bajelani, Sarli and Zazaki. Because Zaza–Gorani belongs to the Northwestern Iranian branch. Shabaki is a language in its own right and not a spoken dialect of any other language, with its own vocabulary and pronunciations, despite the fact that words from many other languages have entered into it as a result of the geographical nearness to other ethnic tribes. Southern Kurdish (کوردی خوارین; kurdîy xwarîn) is a Kurdish group of languages/dialects predominantly spoken in western Iran and eastern Iraq. In Iran, it is spoken in the provinces of Kermanshah and Ilam. In Iraq it is spoken in the region of Khanaqin (Xaneqîn), all the way to Mandali, Pehle. It is also the dialect of the populous Kurdish Kakayî-Kakavand tribe near Kirkuk and most Yarsani kurds in Kermanshah province. There are also populous diasporas of Southern Kurdish-speakers found in the Alburz mountains. Native speakers use various different alphabets to write Southern Kurdish, the most common ones are extensions of the standard Kurdish alphabets. Afrin University was an unrecognized university in the city of Afrin in the de facto autonomous region, the Democratic Federation of Northern Syria (Rojava). It was reported by Al-Monitor that it was the first Kurdish university to open in Rojava, yet that honour goes to the Mesopotamian Social Sciences Academy which opened ten months beforehand; it was, however, the first Kurdish university to open in the Afrin Canton. It opened on 26 July 2015 to an intake of students said to be anywhere from 250 to 850. In August of the same year it had 22 professors (who were required to have a master's degree or doctorate) on their staff, and 6 additional labs (for engineering and medicine) opened at the start of the new term. In August it ran programs in literature (including material in Kurdish languages), journalism, engineering, medicine, and economics. It included institutes for medicine, topographic engineering, music, theatre, business administration and the Kurdish language. The university had a five-year engineering program and four-year programs for all other specializations; and a two-tier fee system for local and international students, with price primarily dependant on the course of study chosen.The university was shut down following the Turkish military occupation of Afrin in January 2018. Students from Afrin were transferred to Rojava University in Qamishli. During the occupation, Ahrar al-Sharqiya (a component of the Syrian National Army) arrested Dr Abdul Majeed Izzat Sheikho, the dean of Kurdish literature at the University of Afrin.